Berwick have been handed an away tie in the first round draw for the Petrofac Training Cup. The draw was made at St Mirren on Monday, and as luck would have it, Rangers were paired with The Buddies, in a game which will be played in Paisley on the weekend of July 25 and 26. Berwick are due to kick off their schedule of pre-season froiendlies this Saturday (July 4) when they take on North Shields at Shielfield, starting at 3pm. 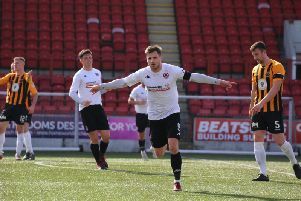 Shields hit the headlines at the end of last season when they won the FA Vase at Wembley, and this will be their first ever visit to the Borders. On Monday, Berwick will take on Dunfermline at Shielfield (7.45pm kick-off). Next Saturday (July 11) they take on Kilmarnock at Shielfield, before Hibs visit the following Tuesday (July 14). Berwick’s final pre-season friendly is against Forfar (away) on Saturday, July 18. Last week the club reported that over 30 players attended training, hoping to catch the eye of manager Colin Cameron. Some are likely to feature in the pre-season friendlies, others will go on to represent the club’s Development Squad. Cameron is hoping to make further announcements with regards to new signings over the coming weeks.